The Center for the Study of Law and Religion (CSLR) has announced plans to focus new research on jurisprudence, social justice, and health, while continuing the work in Christianity, Judaism, Islam, and human rights for which it is internationally known. CSLR’s new focus will yield research projects on the deep interconnections between law, spirituality, and character and on law, religion, and migration. As part of a new research area on law, religion, and health, CSLR plans to develop a new project on law, religion, and sexual health and liberty. The new focus and projects are part of the Center’s 7-year strategic plan, designed to build on the center’s 35-year history as a thought leader in the interdisciplinary field of law and religion. “We are pushing into areas that are a natural fit for us, while still challenging ourselves as scholars to ask questions that have yet to be asked and seek answers that are not easily discovered,” said Managing Director Silas Allard, who graduated from the Center in 2011, earning a joint degree in law and theology. 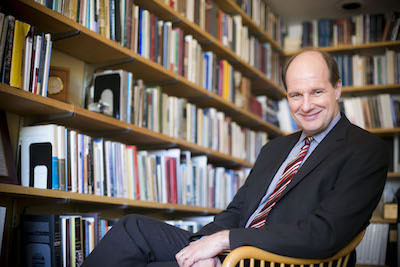 Allard, a scholar of migration, returned in 2013 as associate director. In his new role as managing director, Allard will coordinate the ambitious new research program of the Center and lead work on Law, Religion, and Social Justice, including new work on migration. During its 35-year history, CSLR scholars have published hundreds of books and trained thousands of students, many of whom are now leaders in legal, religious, and academic professions. Scholars from around the world have attended CSLR conferences, which have included as speakers Archbishop Desmond Tutu, His Holiness the XIV Dalai Lama, and Former President Jimmy Carter. Emory’s pairing of religion and law was initially met with skepticism by scholars who believed an emphasis on religion would soften the rigorous study of law or propagate a particular faith or ideological agenda. But the field has instead flourished. There are now dozens of law and religion centers around the world, led by scholars who frequently collaborate with and seek guidance from CSLR. The strategic plan calls for a continuation of longstanding programs in law and Christianity, law, and Judaism, law and Islam, and law, religion, and human rights, with new initiatives to build on the Center’s legacy projects, including and expansion of the Center’s book series in Law and Christianity and Law and Judaism, published with Cambridge University Press. To view the strategic plan, go here.